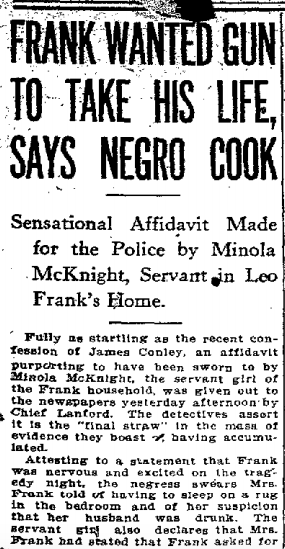 Sensational Affidavit Made for the Police by Minola McKnight, Servant in Leo Frank’s Home. Fully as startling as the recent confession of James Conley, an affidavit purporting to have been sworn to by Minola McKnight, the servant girl of the Frank household, was given out to the newspapers yesterday afternoon by Chief Lanford. The detectives assert it is the “final straw” in the mass of evidence they boast of having accumulated. The affidavit further states that Frank arrived home on the crime date about 1:30 o’clock in the afternoon, and, without eating dinner, left within less than ten minutes. He returned at 7 o’clock at night, the negress swears. Also, she declares that her name was attached to the document of her own free will and accord, and that she was not threatened or persuaded in any form. She was released from prison on an agreement between her counsel, George Gordon, and Chief Lanford. Gordon offered to produce her at the trial, the detective chief declares, if she would be given freedom, and would stand sponsor for her presence. As long as she reports daily to police headquarters and shows no inclination to leave, Lanford says, she will not be molested. Otherwise, she will be returned to prison and held until the courts take up the case. It was announced from Solicitor Dorsey’s office Wednesday that he Phagan case will go before the courts during the week of June 30 instead of the 23d, as has been predicted. No definite decision has been reached, however. It is understood that Dorsey will be ready for the prosecution at the later date, and that unless there are reasons for delay on the part of the defense, the case will proceed expeditiously. Saturday morning, April 26, 1913, Mr. Frank left home about 8 o’clock, and Albert, my husband, was there Saturday, too: Albert got there, I guess, about a quarter after 1, an[d] was there when Mr. Frank come for dinner, which was about half-past one, but Mr. Frank did not eat any dinner and he left in about ten minutes after he got there. Mr. Frank came back to the house at 7 o’clock that night, and Albert was there when he got there. Albert had gone home that evening, but he come back, but I don’t know what time he got there, but he come some time before Mr. Frank did, and Mr. Frank eat supper that night about 7 o’clock, and when I left about 8 o’clock I left Mr. Frank there. Sunday morning I got there about 8 o’clock, and there was an automobile standing in front of the house, but I didn’t pay any attention to it, but I saw a man in the automobile get a bucket of water and pour into it. Miss Lucille (Mr. Frank’s wife), was downstairs, and Mr. and Mrs. Selig were upstairs. Albert was there Sunday morning, but I don’t remember what time he got there. When I called them down to breakfast about half-past eight I found that Mr. Frank was gone. Mr. and Mrs. Selig eat breakfast and Miss Lucille didn’t eat until Mr. Frank come back and they eat breakfast together. I didn’t hear them say anything at the breakfast table, but after dinner I understood them to say that a girl and Mr. Frank were caught at the office Saturday. I don’t know who said it, but Miss Lucille and Mr. and Mrs. Selig and Mr. Frank were standing there talking after dinner. I didn’t know the girl was killed until Monday evening. I understood them to say it was a Jew girl, and I asked Miss Lucille, and she said it was a Gentile. Frank Said It Was Bad. I heard Mrs. Rausin, Mrs. Frank’s sister, tell Miss Lucille that it was mighty bad, and Miss Lucille said, “Yes, it is. I am going to get after her about it.” I don’t know what they were talking about. When I left home to go to the solicitor general’s office, they told me to mind what I said. They paid me $3.50 a week, but last week she paid me $4, and one week she paid me $6.50. But at the time of this murder I was getting $3.50 a week, and the week right after the murder I don’t remember how much they paid me. The next week $4, and the next week $4. One week Mrs. Selig gave me $5, but it was not for my work, and they didn’t tell what it was for. They just said, “Here is $5, Minola,” but of course I understood what they meant, but they didn’t tell me anything at the time. I understood it was a tip for me to keep quiet. They would tell me to mind how I talked, and Miss Lucille would give me a hat. Sworn to and subscribed before me this third day of June, 1913.